Think a water trough is just for the delights of farm animals? 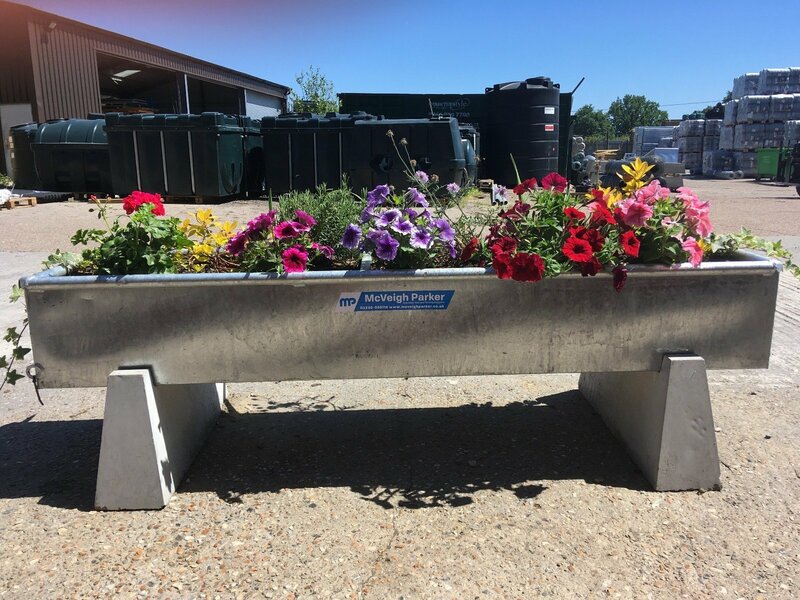 Then think again… Here are just 5 reasons why a galvanised steel trough from McVeigh Parker make the perfect garden planter! OR skip straight to our instructions below! 2. Contemporary design – Rolled top edges and sheet steel galvanised structure, its strong lines will add a sleek and streamlined look to any garden, be it a balcony in Clapham or a cottage garden in Headcorn. 3. The Look - Although very shiny when new, they will soon dull down with age and become a very soft grey look, alternately you can accelerate the process to give an authentic aged appeal earlier by using toilet cleaner and a wire brush (see various web sites on ageing galvanised steel for guidelines). Or alternatively why not add some distinctive effects with gloss paint to your design. 4. The ease - Why not add ready made concrete supports made to carry and suit our standard range of troughs. Although these are heavy to install they provide a strong support at a convenient height for planting and weeding. Alternatively a cheaper option would be to put your planter on timber supports. 5. Striking display with minimal effort – in less than 1 hour you will have created a focal point admired throughout the year with minimal upkeep and maximum effect. Numerous other uses for galvanised planters, hay or willow soaker, water feature, ideal for bulk water storage for allotments and large gardens, rainwater collection etc. 1. Decide on the placement of your water trough. Do you have a spot in the garden which needs brightening up, or do you want a planter for all to see and enjoy? 2. Choose the perfect water trough for your garden. At McVeigh Parker we stock a range of water troughs including our popular Livestock Water Trough available in a variety sizes of sizes from 60cm (2ft) to 3m (10ft) long, or if you are after a shallower profile, our Sheep Water Trough ranging from 60cm (2ft) to 2.80m (8ft) long. We used a Sheep Water Trough measuring 1.83m (6ft) long and 28cm (11inch) deep. Another thing to consider is whether to use our concrete trough support, although alernatives include timber props or even bricks. 3. To ensure the trough planter has sufficient drainage, place a 5-10cm (2-4inch) layer of gravel evenly across the bottom of the water trough. 4. On top of the gravel, place a piece of textile membrane along the trough. This will keep the soil in place, stopping it from washing away under the gravel when watered. 5. Cover with your preferred compost. We used a general multi purpose compost mixed with fertiliser for added growing power. 6. When considering plants for your planter, try to take in to account the changing seasons and select plants for the back, middle, front and sides of the planter. It was late spring / early summer when we planted ours and we opted for Gladioli bulbs for the back, a mix of hardy perennials including Aucuba ‘Golden Girl’ and Escallonia ‘Golden Ellen’ for the middle mixed with bright favourites such as Scabiosa. We also added some beautiful smelling Rosemary and Lavender to excite more of the senses! For the front and sides we planted a mix of trailing petunias and geraniums, alongside some ivy for interest. For the front top we opted for upright petunias which will spread and offer a pleasing vail of colour. 7. Place your plants on top of the soil and arrange until you are happy with the display. 8. Plant, water and enjoy! Click here to shop our water troughs now!